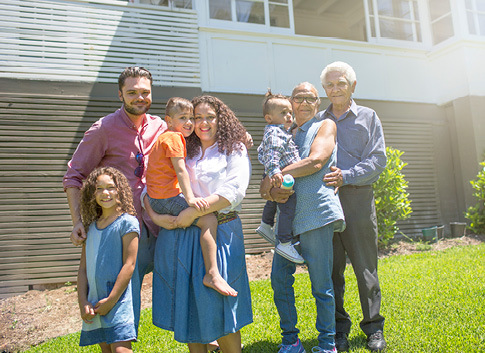 From mortgages to home equity lending, our team is here to help get you settled and make your house into a home. Ever wanted to build your dream home? Ready to buy a home? We can find the right loan option for you by assessing your lifestyle, finances, and home goals. This is the most popular type of home loan because it is easier to budget. Fixed rate home loans have the same interest rate for the life of the loan. Generally, the shorter the term, the lower the rate. The Federal Housing Administration backs qualified loans provided by Northwest Community to promote home ownership to those with limited savings. This loan is good for those who are looking to buy their first home but don’t have a 10% down payment. The Department of Veteran Affairs backs mortgages provided by Northwest Community to qualified military members. If you’ve got a vision for your perfect home, our construction and land loans allow you to secure financing that fits your building needs! This loan is ideal if you want to purchase land and need additional time to complete your home building plans. Short-term lot loan allows you to purchase your dream property while you prepare to build! When you're ready to build, you may be able to use existing equity to roll your existing land loan balance into our One-Time Close construction loan. This loan is best if you're looking for construction and mortgage financing in a single loan transaction. Construction and permanent financing for your personal residence are combined into one loan with one closing. This loan is best for people who have specific borrowing needs that may not fit other loan programs. A separate construction loan is granted for the construction phase of your project. Once your home is completed, the construction loan is refinanced via a separate permanent mortgage. *Rates shown are Annual Percentage Rates (APR). Land-only loan assumes $150,000 with interest-only payments and a balloon payment due in 36 months. Rates will vary depending on credit condition, term of loan and payment option. All loans are subject to approval. Regular terms and conditions apply. Rates shown are subject to change without notice. Loan terms available may vary depending on amount borrowed, credit history, or payment method. Rates shown may be based on auto pay participation. NWCU is an Equal Opportunity Lender. Call (800) 452-9515 or see branch for details. You may be able to save thousands of dollars with a refinanced loan. If you’re looking to refinance your first mortgage with a quick, low-fee process; or if you don’t have an existing mortgage but want to take one-time equity out on your home, this is a good option for you. Members interested in taking one-time equity out of their homes with no existing first mortgage. If you’d like to take equity out of your home with an existing first mortgage that you’d prefer not to refinance as part of the transaction, this loan is for you. Members interested in taking one-time equity out of their homes without refinancing an existing first mortgage. Our variable-rate home equity line of credit allows you to borrow money, pay it back, and borrow again during the 10-year draw period. The 1st Position HELOC is great for members who’d like ongoing access to equity with no existing first mortgage. The 2nd Position HELOC is great for members who’d like ongoing access to equity and have an existing first mortgage. *APR is Annual Percentage Rate. The annual percentage rate is based on the value of an index. The index which is the Western Edition Wall Street Journal Prime Rate. The annual percentage rate can change quarterly on the 11th day of January, April, July and October. **To open your account, you must pay certain fees to third parties such as appraisers, credit reporting firms, and government agencies. These fees generally total between $379.00 - $513.00. Upon request, we will provide you with an itemization of the fees you will have to pay to third parties. Believe in You. We Do.